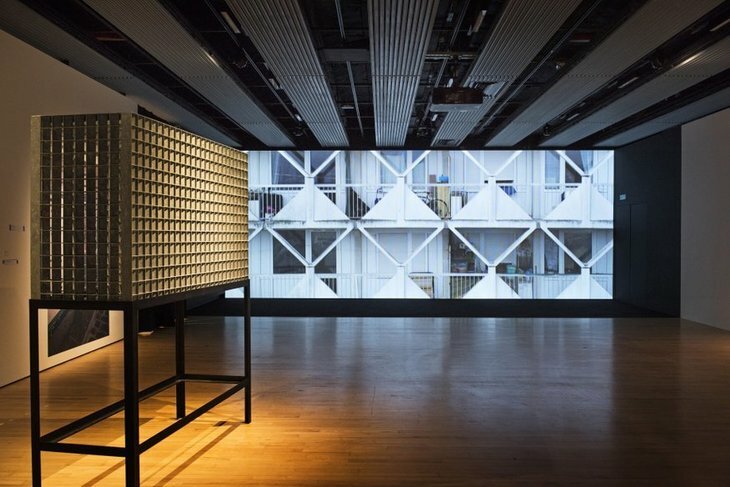 The Hayward Gallery has opened two shows, one per floor. 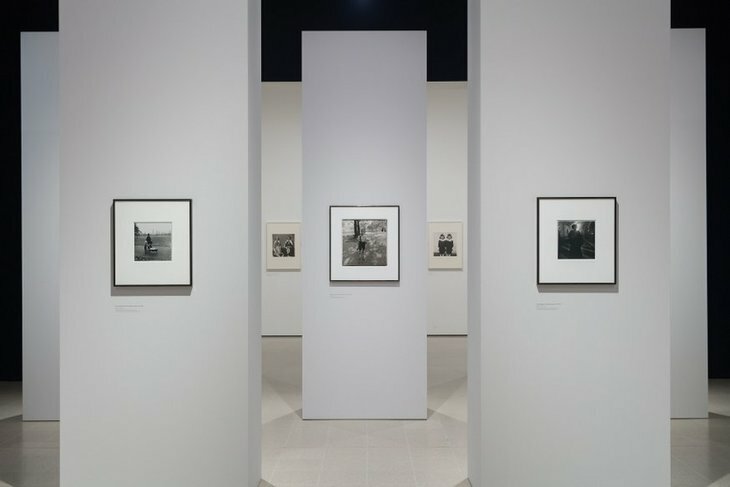 The black and white portrait photography of Diane Arbus takes up the upstairs while Kader Attia's political and conceptual works occupy the ground floor. So we've split out our review accordingly. 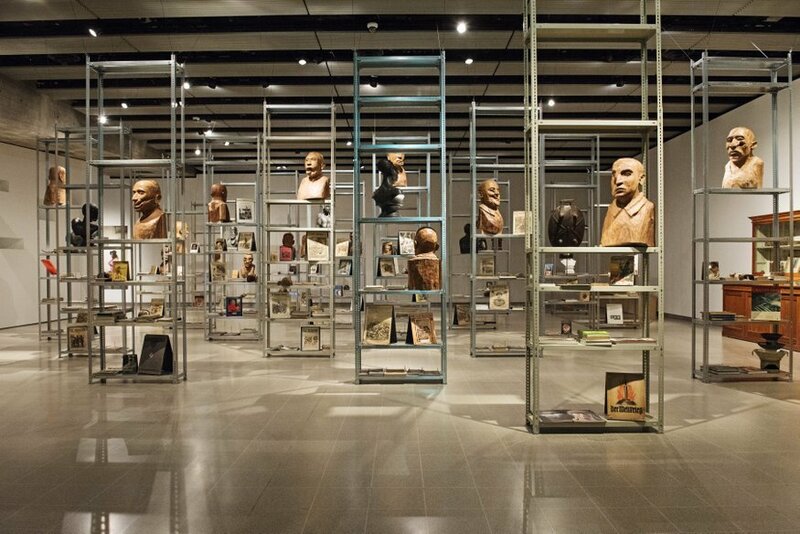 An impressive installation by Kader Attia. Copyright the artist and courtesy Hayward Gallery. A camera pans slowly up the height of the Robespierre Tower — a rather grim looking residential block in Paris. Once it crests the top it's a relief to see the city beyond, rather than a claustrophobic close-up of the building. The effect garners sympathy with artist Kader Attia and his description of it as inhuman modernism. Opposite a cinder block hangs delicately over a mirror, one slip and the whole thing falls apart — it captures exactly how we often feel, zipping along London just about trying to keep our lives together. Kader Attia's exhibition is full of impressive installations but they're often confounding. Sometimes they resonate, like the cinder block, but other times they don't — a wall of photos of famous individuals from Lenin to Ella Fitzgerald all express different emotions. It's not entirely clear what you're supposed to take away from this wall: that all humans have emotions? We think most people already know that. The mesmerising scroll up the Robespierre Tower. Copyright the artist and courtesy Hayward Gallery. Then there's an equally baffling pair of shoes reflected in a mirror before we arrive at our favourite two rooms. Attia examines the lack of acknowledgement of African art in Western art by placing a mask next to a book featuring Edvard Munch's The Scream. A taxidermy cheetah and an African mask in a vitrine show how both wild animals and African culture have been placed in museums as recognition of European dominion over both worlds. It's a challenging statement, executed in an intelligent manner. The largest installation is made up of rows of shelves that look like they're out a museum storage facility. Stacks of books and busts reference the first world war and the facial reconstruction surgeries carried out to those injured in conflict. The artist is drawing a link in the similarities between the facial modifications of certain African tribesman and the post-war facial reconstruction surgeries. While it's clear they look visually similar and there's a general thread of modification and repair throughout a lot of Attia's work, it often feels like the connections he's drawing are very loosely affiliated. Attia's work is extremely diverse and often very powerful, although there's sometimes a sense that despite the artist knowing what he's trying to convey to the audience, the communication just isn't clear enough. A close up of one of her photos. Copyright the artist and courtesy Hayward Gallery. Photo: Mark Blower. Upstairs is a complete contrast to Attia's scattered approach, with a very tightly focused photography show. It's all about Diane Arbus' first seven years in her career as a photographer. These small works are presented beautifully, on pillars erected in the gallery. All sit in her usual style of photographing people going about their lives or those specifically posing for her. A shot of the beautiful design of the show. Copyright the artist and courtesy Hayward Gallery. Photo: Mark Blower. Arbus is best known for her photos of carnivals and these stand out the most — whether it be the human pincushion impaled with various needles or the rather horrific Siamese twins in a jar on a shelf. 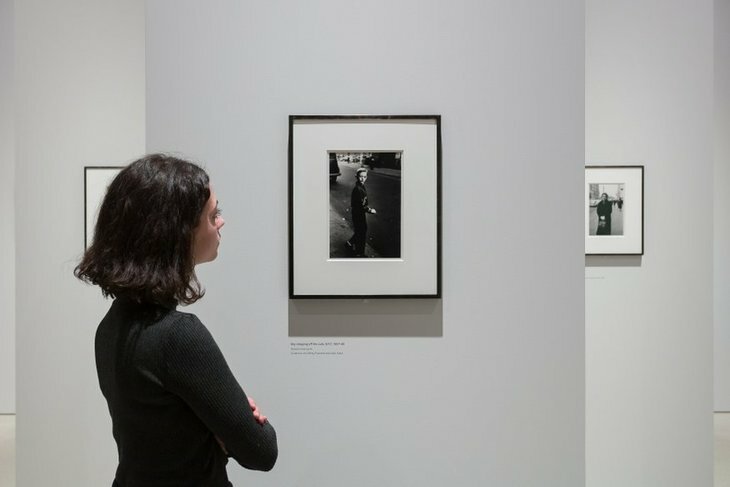 Some of her photos makes us want to know more about the individuals she's snapped, while others to closely resemble her other works nearby — thus making the show feel repetitive at times. There's no denying Arbus' skill as a photographer but there wasn't enough variety to keep us interested for longer than 15 minutes. This one's for major photography buffs only. Kader Attia: The Museum of Emotion and Diane Arbus: In the beginning are on at Hayward Gallery until 6 May. Tickets are £14 and include admission to both.